The Lone Star state is no stranger to outbreaks of the protozoal parasite, Cyclospora, in recent years, seeing 133 cases in 2014 and 270 in 2014. It looks like 2015 will continue the recent trend as Texas has reported 113 cases of cyclosporiasis as of July 3, with 101 cases reported in just the past two weeks, according to the Texas Department of State Health Services (DSHS). Nearly half of this years cases, 52, or 46 percent of the total were reported out of Travis County and the city of Austin. Health officials have yet to pinpoint a food source for the current outbreak and the investigation is ongoing. 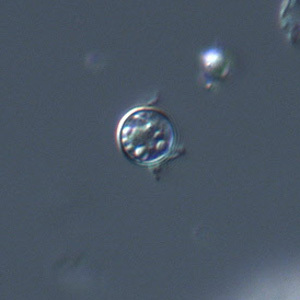 Cyclospora cayetanensis is a single-celled protozoal parasite that causes an intestinal infection called cyclosporiasis. The parasite is spread by people ingesting something – such as food or water – that was contaminated with feces. It is unlikely that Cyclospora is passed directly from one person to another as it is noninfectious when excreted, requiring 7 to 15 days to sporulate and become infectious. The first published report of Cyclospora infection in humans can probably be dated to 1979 in Papua New Guinea. Some cases emerged in the US in the 1980s as the AIDS epidemic unfolded. It was not until the mid-1990s did physicians and the public in the US and Canada really take notice. Approximately 850 cases of laboratory-confirmed Cyclospora infection in persons residing in the United States and Canada whose onset of illness was in May and June 1996 have been reported to CDC and Health Canada.The outbreak was linked back to Guatemalan raspberries. Outbreaks in the US have occurred since that time with the largest being in 2004 when it was linked to snow peas from Guatemala, a 2005 outbreak linked to basil from Peru and a number of outbreaks linked to raspberries. In a number of outbreaks, the food source has never been identified. One of the largest outbreaks of cyclospora infection occurred in 2013 with a total of 631 persons with cyclosporiasis were reported from 25 states and New York City. The findings in the investigations suggest that there was more than one outbreak of cyclosporiasis during June–August 2013 in the United States. Restaurant-associated illnesses in Iowa and Nebraska were linked to salad mix from Taylor Farms de Mexico in Guanajuato, Mexico. Some illnesses in Texas were linked to fresh cilantro from Puebla, Mexico. In 2014, a total of 304 ill persons with confirmed Cyclospora infection were reported to CDC. Epidemiologic and traceback investigations conducted by state and local public health and regulatory officials in Texas and the FDA indicate that some illnesses among Texas residents were linked to fresh cilantro from Puebla, Mexico. Cyclospora infects the small intestine (bowel) and usually causes watery diarrhea, with frequent, sometimes explosive, bowel movements. Other common symptoms include loss of appetite, weight loss, stomach cramps/pain, bloating, increased gas, nausea, and fatigue. Vomiting, body aches, headache, fever, and other flu-like symptoms may be noted. Some people who are infected with Cyclospora do not have any symptoms. The recommended treatment is a combination of two antibiotics, trimethoprim-sulfamethoxazole, also known as Bactrim, Septra, or Cotrim. People who have diarrhea should also rest and drink plenty of fluids.